← Stella Turns 3 and Birthday Treats! If you happen to have bought some bourbon to make cheesecake, then I have just the way to use it up. This cocktail is perfect for fall, but it has a spicy zap that will keep you warm in winter too. To make it, fill 4 glasses and a cocktail shaker with ice. 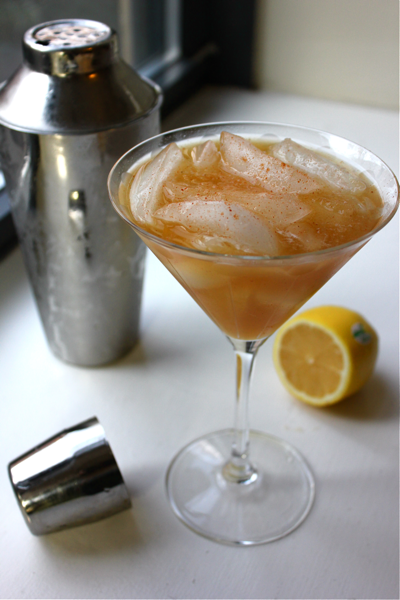 To the shaker, add 6 ounces of bourbon, 1 cup of apple cider, 4 teaspoons of lemon juice, and 2 teaspoons of maple syrup. Shake the ingredients very well, and strain them into the glasses. Top each glass with a sprinkling of cayenne pepper for beautiful color and an even more satisfying finish. Take a sip of the cocktail, nibble a graham cracker, and repeat. This recipe is from Martha Stewart’s Everyday Food. These sound terrific. Getting the ingredients today!